You probably don't have the ingredients for this lying around your kitchen. I wouldn't have, either, but my thoughtful and generous mom brought them over along with the recipe, my dad right behind her proclaiming this the BEST soup he's ever had. I'd never even seen lemongrass before, but Mom said she bought it at Safeway. So there you go. It looks like a large green onion, or maybe like a leek. So keep your eyes open in the produce section. I don't know if the Thai fish sauce and Thai chili paste came from the grocery store or a specialty market. But I do know the soup was delicious, and it went together quickly. Shopping for the ingredients will be the hardest part. This is a perfect recipe to use some of that leftover Thanksgiving turkey. In medium saucepan, mix together coconut milk, broth, ginger, and lemongrass. Bring to boil. Fish out ginger and lemongrass and discard. Add turkey, mushrooms, lime juice, fish sauce, sugar, and chili paste and simmer over low heat until mushrooms are cooked (5 minutes or so). Garnish with basil and cilantro if desired. If you're going to have a pile of hungry mouths to feed this week, consider making this delicious quiche, which my friend Charlene shared last week at our Moms in Touch prayer meeting. It can serve as breakfast, lunch, or dinner. Make it a couple hours ahead, if possible, so it has time to "set." The crust is a large tortilla, and the rest of the ingredients are super quick to throw together. When I made it, I doubled the recipe, and there was enough filling to make three quiches, not two. How's that for an extra bonus? In Charlene's words: "Here comes the hard part -- Mix it all together in one bowl! Dump it onto the tortilla pie crust." Bake at 350 degrees for 55 minutes or so, until it doesn't look gooey in the middle. Oh how I love recipes that can be labeled super simple. 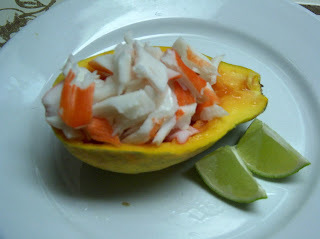 As in Super Simple Seafood Papaya Boats. Which are simply delicious. Even if you've never tried papaya before, give this a go. Papayas are in season this month. Cut the papaya in half lengthwise. Scoop out those little black seeds. I discard them, but read recently that the seeds are edible, with a peppery flavor that works well as a garnish or in salad dressing. (I've never tried this. Any faithful readers ever eaten the seeds?) Fill cavity with seafood and serve with wedges of lime. To eat, simply scoop out with spoon, leaving outside of papaya as the "bowl." That's it! I hope you love this. Hop over to Kelli's blog, There is No Place Like Home, if you want to participate in her "Giving Thanks" celebration this week (Monday through Thursday). Kelli invites everyone to share crafts ideas, recipes, Thanksgiving traditions -- anything to do with Thanksgiving. My contribution: garlic cheese rolls. This is the closest recipe I've ever found to the delicious yeast rolls my grandma used to make daily back on the family farm in Virginia. When you bite into one . . . mmmmmm. Like eating buttery air, only better. These make a wonderful addition to the Thanksgiving dinner table. I make them in the bread machine, so they don't take a whole lot of effort. The recipe makes 24, but you'd better count on everyone eating at least two or three. The Big Kahuna himself created this one, and it's a winner. Slice each chicken breast into pieces about 2 inches wide. Soak in Italian dressing for as long as you like (anywhere from an hour to overnight; refrigerated, of course). When ready to cook, use slotted spoon to remove chicken to skillet. (You can pour in a little bit of the dressing if you like, but you shouldn't need much.) Cook four to five minutes each side over medium-high heat. Remove to plate. Sprinkle with Mozzarella, if desired. Eat up. Yes, you read that right. Salmon you can steam in your very own dishwasher. I was not aware this delicacy would be of interest to anyone until I left a comment here and learned that, er, well, not everybody actually cooks in their dishwasher. And to answer your next question, yes, you can wash your dishes in the same load if you want. But I'm a little squeamish on that score. The idea of Cascade infiltrating my tin foil -- even if it's the lemon-scented kind -- makes me wince. I'll take my water plain, thank you. It's just a personal preference. Here, then, by popular demand, are the instructions for making deliciously moist and steamy dishwasher salmon. It's important that your dishwasher has a drying cycle, by the way. Otherwise, the recipe won't work. First, wrap your 3- to 4-pound hunk of salmon really, really well in tin foil. You can season with salt, pepper, lemon juice first if you like, but you don't have to. Double wrap, triple wrap, even quadruple wrap if you want. Whatever it takes for you to feel comfortable that that sucker is really wrapped. Tight. Put it on the top rack of your dishwasher, shut the door, and run the dishwasher on the regular cycle. Not the shortened, energy saving one, or it may not get hot enough, and not the pots and pans cycle or it may overdo. That's it! Open 'er up and serve. Tonight we sliced it , sprinkled on a little balsamic vinegar, served it on greens with fresh pineapple and avocado chunks and topped it with a lemon vinaigrette. This steaming method, by the way, was originally developed by Eskimo women and was highlighted at Montreal's Expo '67, according to my trusty cookbook Holiday Home Cooking. I'm not sure just where, in the igloo, one's electric dishwasher would go . . . but I suppose that's a problem I'll leave the Eskimo women to grapple with. Now onto the next burning question: has anyone ever tried tenderizing meat by running over it with the car? Inquiring minds want to know. Check out more great ideas at Works-For-Me Wednesday. OK, so this isn't a recipe, exactly. It's more of an idea, for when you want a festive party dessert but don't really have the time to make one. First, you buy a graham cracker pie shell. 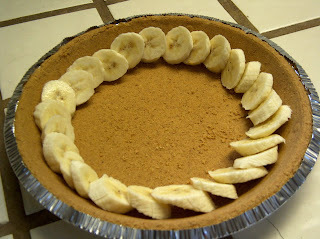 Next you slice up two bananas, on the diagonal, and overlap them around the edge of the pie shell. 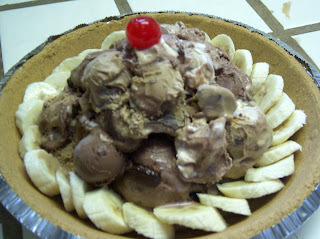 Then you scoop out three of your favorite kinds of ice cream (you will use about a half-pint of each). Pile them into the pie shell. If you have a melon baller or a small ice cream scoop, you can use that to fill in the gaps between the larger scoops. Top with a cherry, stick in the freezer for at least an hour, then serve later in slices, along with chocolate sauce. Note: For more great holiday recipes, check out Holiday Cooking, Blogger Style at Overwhelmed With Joy. So many recipes, so little time. Sigh. Equally important note: check out Be Jolly, By Golly! 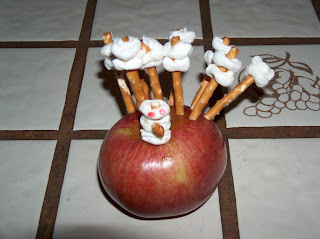 for more festive holiday food ideas. 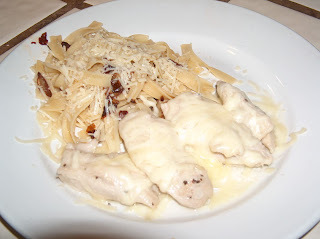 This recipe is brought to you courtesty of Molly at The Bumbles Blog. I had never even heard of maple vinaigrette until she sent this waaaaay yummy recipe my way. You will have to control yourself not to drink the leftover dressing once the spinach part has disappeared. Also noteworthy are the toasted nuts, Gorgonzola cheese, apple chunks, and dried cranberries. So stinkin' good you'll forget you're eating something good for you. In slow stream, add oil into vinegar and whisk. Slowly add syrup while whisking. Pour over salad right before eating. Note: Check out The Recipe Box Swap if you want to troll around for more yummy recipes. Fun fact: Did you know there's actually a food item called a "spring chicken"? I have no snappy retort for this. Just a dazed and surprised expression. Much like this. I love my mini-muffin pans. You end up with the perfect-sized little snack. Unless, of course, you eat eight or ten of them. But we wouldn't do that. No we wouldn't. Heat oven to 375 degrees. Butter your muffin tins (this will make about 30 mini muffins, or about 6 regular-sized ones). In medium bowl, beat butter and 1/2 c. sugar with electric mixer, until smooth. Add egg and beat. Stir in baking soda and grated lemon zest. Add half of flour, mix well, then half of buttermilk. Mix well. Finish with rest of flour -- mix -- and rest of buttermilk. 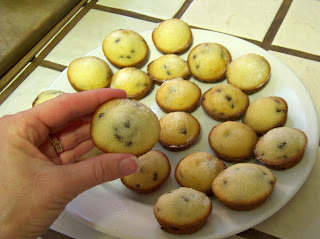 Now add the chocolate chips, and spoon batter in to muffin tins. Bake about 10 minutes (if you're making regular-sized muffins, about 20 minutes), until lightly browned. Remove from oven and brush lemon juice over warm muffins, then sprinkle with remaining sugar. Note: Don't forget when baking muffins, if at the end of the batch you have a couple of empty cups, fill them with water before putting the pan in the oven. That way you won't end up with a scorched tin. 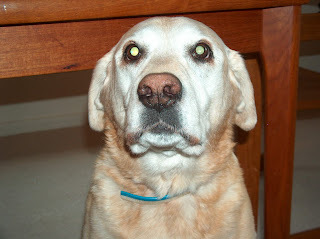 Anyone have any favorite muffin combinations to share?
. . . other than chocolate pecan pie, that is.